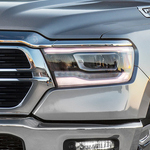 Low-Risk Drive in the 2019 Ram 1500 Pickup Truck | Southey Motors Ltd. Powerful and tough, the 2019 Ram 1500 pickup truck is designed to execute light-duty jobs. Southey Motors Ltd. encourages local customers to explore more than 100 safety and security features that are available in this durable vehicle. The all-new Trailer Detection technology gives you peace of mind for towing on the highway. This all-new feature covers blind spots around and behind an attached trailer. Additional cues might be given by the Rear Cross Path technology, which usually comes on when the reverse gear is selected. Before you attempt to move into another lane, pay attention to any feedback from the Blind Spot Monitoring System. This Ram pickup truck helps several other accident-avoidance features that are tuned for urban driving. For example, the Advanced Brake Assist senses sudden deceleration by another car that's in front. When the traffic slows down, you'll be immediately notified by the Forward Collision Warning.